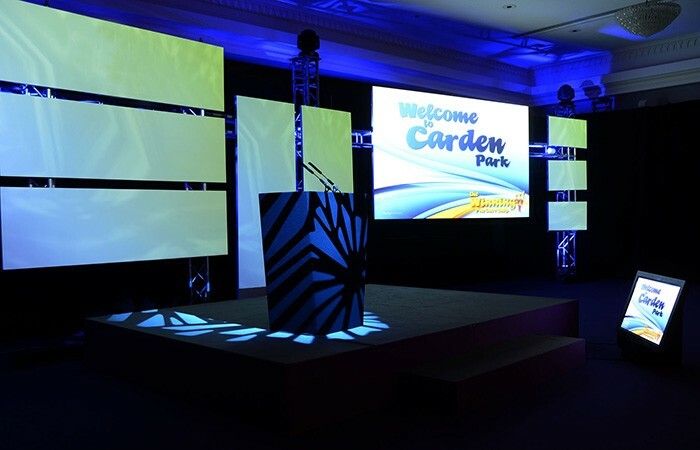 dbn Lighting delivered a complete lighting and staging – both design and equipment – and rigging solution to John Brandwood Presentation Management for an event staged at the very elegant Carden Park Golf Resort & Spa near Chester. 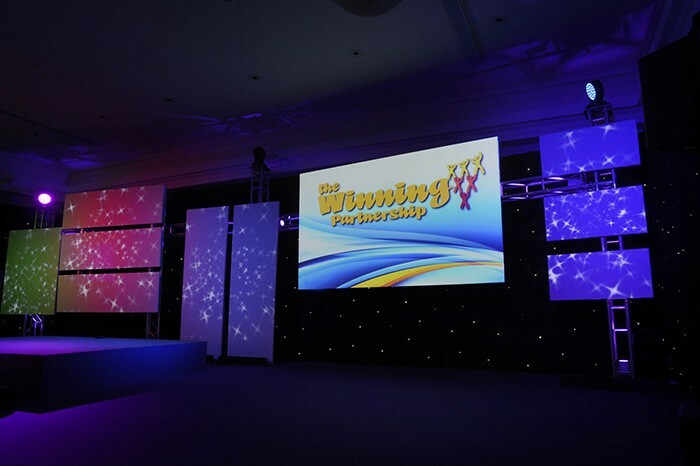 A flexible approach was needed for the lighting and visuals, and this was undertaken by dbn’s Nigel Walker. During the day, the event – for a roofing specialist client – took on a standard conference and business meeting format, complete with an exhibition area located in an adjoining part of the venue. 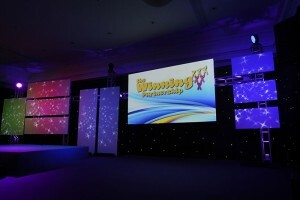 The meeting space then morphed swiftly into a gala dinner / awards ceremony and cabaret for the evening, hosted by popular raconteur, Tony Hawkes. Walker specified Robe DigitalSpot 3000DTs, Robe LEDWash 600s and Clay Paky Alpha Spot 300 HPEs as the moving lights, which were installed on front and back trusses which also formed part of the ground support system and set. The DigitalSpots and Alpha Spot 300 HPEs were on the front truss together with an array of generic fixtures including ETC Source Four Juniors, Strand SL Zoom Profiles and ADB Fresnels. On the back truss were the LEDWashes, which were used for set washes and back lighting, together with eight ChromaQ Color Block MkII Batten LED wash lights positioned around the floor area. Media for the DigiSpots was supplied by John Brandwood and uploaded to the fixture heads. It was then programmed by Walker using a Jands Vista T2 console running the latest Byron 2.2 software, utilising a combination of the supplied bespoke content, DigitalSpot library footage and some custom video clips created by dbn. It was projected onto a series of different sized individual panels at the back of the set, suspended from the Slick mini-beam trussing structure, which was toned with AR111 TriLED fittings and visible behind the projection surfaces. The far upstage back wall and sides of the room were wrapped with a fibre optic starcloth, also supplied by dbn, together with a pipe-and-drape system that supported it and other ‘soft’ elements of the set. Says Walker: "The client wanted something different, modern and with a bit of an industrial feel, and the toned Slick trussing system at the back was the answer." He worked alongside Ed Croft and Stef Ostafijzuck from dbn for the event which ran over two days including the get-in and set-up. Lighting for the exhibition was also provided and installed by dbn.